The spiny and oftentimes sharp spikes protruding from the backs of some lizards serve a couple purposes for these reptiles. They are for looks -- for appearing threatening to other predators. The spikes also make it harder if not even painful for predators to get their mouths around a spiked lizard to make him a meal. In some lizards, the rows of spikes also work as a water collection system. He's known by several names -- devil lizard, horned lizard, thorny dragon. Each variation acknowledges his unique appearance created by the spiny, wartlike spikes covering his back and the sides of his body. His body features a white base with orange, black and yellow spots on his body and spikes. The thorny devil resides in desert areas across the globe including the Australian outback, where he voraciously dines on black ants -- up to 5,000 in a single meal. The short-horned lizard has a flat, squat shape often earning him an alternative name -- horned toad. He lives in the deserts of North and and Central Americas with populations as far north as Canada and as far south as Guatemala. His body sports yellow, gray or reddish brown depending on the locale. He has an impressive crown of thorns on his head that continue to his back in the form of spikes. Despite this, the short-horned lizard often goes out of this world as a meal for predators such as coyotes, wolves, birds of prey, snakes and roadrunners. This critter has a single row of large, dark-colored spines running down his back. An area of dark scales follows each side of the row of spines. While named for Texas, he resides in Kansas, Louisiana and the states between, as well as northern Mexico. He likes to cover himself with sand and is mostly spotted near dawn and the few hours following, as well as in the couple hours prior to dusk. The back of a green iguana features a singular row of spines extending from the base of its head to the tip of its tail. Green iguanas live mainly in Central and South America, but small groups reside in the Indian islands. They are highly social critters who live cooperatively in groups, sunbathing and feeding on trees together. 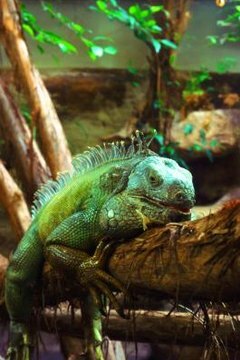 The International Union for Conservation of Nature and Natural Resources lists green iguanas as endangered species with a decreasing population due to the destruction of rainforest habitat and the removal of too many individuals to meet the demands of the pet trade industry, the Smithsonian National Zoological Institute reports. The desert horned lizard makes its home in high desert areas along the Colorado River and the Gila River, a tributary of the Colorado flowing through New Mexico and Arizona. The desert horned lizard also lives in the Sonoran, Mohave and Great Basin scrub desert areas of Arizona. He feeds mostly on ants and enjoys the larvae of moths and butterflies. Rather than having a distinct row of spikes, his back is dotted with isolated and pointed scales. His body features a tan, gray or brown base color designed to match the sand of his environment. The lower portion of his body may have peach, salmon or orange blotches. Prior to extensive development in southern California, the coast horned lizard's natural territory extended from Baja California in the south to the San Fransisco Bay in the north. The creature's eastern boundary was the Kern Plateau near the Sierra Mountains near Nevada. Today it lives in pocketed, undeveloped sections of its previous range. The coast horned lizard has a flat, oval-shaped body with two rows of spikes on each side of his body just at his back's curve. His belly is cream, beige or yellow with dark spots to match the rest of his body that is colored either red or brown.